The Multistrada 1260 truly maximizes the concept of versatility: The 1262 cc Ducati Testastretta DVT engine extends powers even in low gear, the chassis and cutting-edge electronics improve control and ease of driving in any condition and on any road. The following features include information for all models within the Multistrada 1260 Family and may not be applicable to all models. Please see your local dealer for further information. FRAME: The Multistrada 1260 chassis is based on the use of a frame and a longer swingarm. The steering angle has been increased by 1 degree, from 24° to 25° while the swingarm is 48 mm longer. These changes have led to a total increase of the wheelbase of 2.17 in. (55 mm). This, coupled with the character of the engine and the suspension calibration, mean that the Multistrada 1260 is even more effective when tackling curves whilst ensuring maximum stability even at full load, with side panniers and pillion rider onboard. The ""layout"" adopted for the frame consists of a front trellis with large diameter thinner tubes, two side subframes enclosed by a rear support element made of fiber loaded engineering plastic for maximum torsional rigidity. The single-arm swingarm is obtained from a single die-cast, with four cores bonded together on the inside, subsequently machined and painted. The result is a magnificently sculpted, beautiful and functional component, bestowing ulterior prestige to the Multistrada 1260 and guaranteeing excellent road grip. SUSPENSIONS: The S version suspensions of the Multistrada 1260 are of the semi-active type and are controlled by the Ducati Skyhook Suspension (DSS) Evolution system. The Multistrada 1260 features a Kayaba 1.89 in. (48 mm) upside-down front fork with dedicated cast leg, with fully adjustable features (spring preload, hydraulic brake in compression and rebound, all on both forks). At the rear a Sachs shock absorber connects the swingarm to the left cast subframe: once again the features are adjustable - remote spring preload with hydraulic torque and hydraulic brakes in compression and rebound. The spring is progressive, resulting in increased riding comfort even when carrying the maximum load allowed. The S versions of the Multistrada 1260 are fitted with a 1.89 in. (48 mm) Sachs fork with the sleeves in the characteristic grey ceramic that identifies semi-active suspensions and forged legs. The rear shock absorber is manufactured by Sachs. Both the suspensions are of the semi-active type and are controlled by the Ducati Skyhook Suspension (DSS) Evolution system. In addition to adjusting the compression and rebound damping adjustment and rear spring preloading, automatic and integrated in the Riding Mode or customisable via the on-board computer, the semi-active system continuously monitors these elements to ensure the perfect balance of the vehicle. Both suspensions allow a 6.7 in. (170 mm) front and rear wheel travel, a value that guarantees absolute comfort when travelling even at higher load values, and extra safety when riding on soft off-road tracks. The sensation of pure comfort is further enhanced in the S versions by the DSS Evolution function that allows the rider to quickly and easily adjust the track alignment of the bike according to the various riding configurations and the type of trip: single rider, rider with panniers, rider with pillion rider and rider with pillion rider and panniers. The suspensions, on both the new Multistrada 1260, and the new Multistrada 1260 and D|Air have revised internal calibration. 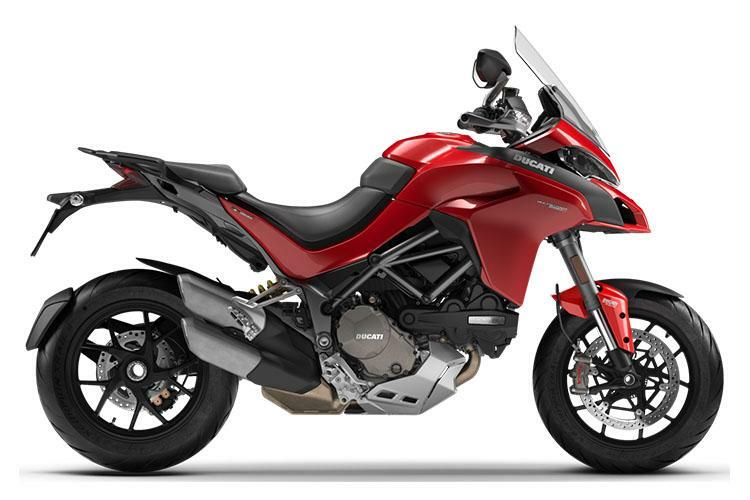 TIRES AND RIMS: The Multistrada 1260, 1260 S and 1260 S D|Air are all equipped with Y-shaped 5 spoke light alloy rims, 0.75 lb. (0.34 kg) lighter than those mounted on the previous model. All versions are equipped with rims measuring 3.50 x 17 in. on the front and 6.00 x 17 in. at the rear, mounting a Pirelli SCORPION™ Trial II 120/70-17 in. tire on the front and 190/55-17 in. on the rear. DVT SYSTEM: Developed and fine-tuned by Ducati engineers, the DVT system optimises performance and fluidity of delivery at all end speed levels. The Ducati Testrastretta DVT (Desmodromic Variable Timing) engine, which varies both the timing of the camshaft that controls the intake valves, and the camshaft that controls the exhaust valves independently, it optimizes performance at high speeds to achieve maximum power, while improving smooth delivery and increasing torque at low and medium range speeds. This means you have an engine that changes its characteristics by continuously varying the rpm without the rider even noticing it, remaining within the Euro 4 approval requirements whilst paying great attention to fuel consumption. DISPLACEMENT AND TORQUE: Thanks to itsdisplacement of 1262 cc, the Multistrada 1260 engine sets outstanding riding and performance standards. In developing this engine, derived from the unit fitted on the Multistrada 1200, Ducati engineers focused on guaranteeing the maximum and best possible torque delivery at low and mid range engine speeds. 85% of the torque is in fact already available below 3,500 rpm with an 18% increase in the curve at 5,500 rpm compared to the previous model. All this makes the Multistrada 1260 the motorcycle with the highest torque value in its category, an exceptional 4,000 rpm, i.e. the average rpm rate used when riding. To reach this displacement level, the piston stroke was increased to 2.81 in. (the bore remains 4.17 in.). This was achieved thanks to the use of connecting rods, a crankshaft and cylinders. The DVT system was then recalibrated to maximize mid to low range engine torque delivery, leading to a maximum power of 158 hp at 9,750 rpm and a maximum torque of 95.5 ft. lb. at 7,500 rpm. EXHAUST SYSTEM: In order to achieve the extraordinary performance of the Multistrada 1260, the exhaust and intake systems were also redesigned. The exhaust has a pipe design, a internal layout of the pre-damper and a silencer, while the air intake inlet area has also been redesigned. DESMO APPEAL: The Ducati Testastretta DVT also uses the engine valve timing system that has made Ducati famous throughout the world. Thanks to this particular system, the intake valve and exhaust valve are mechanically closed using a technique and accuracy similar to those of the opening phase. The term Desmodromic comes from the Greek terms ""desmos = controlled"" and ""dromos = movement, path""; in mechanics it is used to describe mechanisms which have both a command to activate them in one direction and another command to activate them in the other (known as closing or return). This system, used on all Ducati models, demonstrates its validity (efficacy) also on the Ducati Corse Superbikes and Desmosedici MotoGP bikes. In the design of the Ducati Testastretta DVT engine, the desmodromic solution provided a clear advantage over a traditional spring system. Actuating valves at low engine speeds requires less force, as there is no compression of springs, and this has resulted in the possibility to contain the size of the individual variators which, in turn, brings advantages to the containment of weight and overall system integration. ABS CORNERING: The entire Multistrada 1260 family is equipped with the Brembo braking system fitted with the ABS 9.1ME Cornering device, an integral part of the Ducati Safety Pack (DSP). DUCATI SKYHOOK SUSPENSION (DSS) EVOLUTION: The Ducati Skyhook Suspension Evolution system has been tweaked even further, with new forks and sensors. VEHICLE HOLD CONTROL: The ABS that is installed on the Multistrada 1260 is equipped with the Vehicle Hold Control (VHC) system. When activated, the system keeps the vehicle still by activating the rear brake (and automatically deactivates after 9 seconds if it is not used). TFT INSTRUMENT PANEL: The Multistrada 1260 is equipped with a high visibility LCD instrument panel with an information display and simplified menu management. Front - 5-spoke Y-shape cast light alloy; 3.50 x 17 in. Rear - 5-spoke Y-shaped cast light alloy, 6.0 x 17 in.